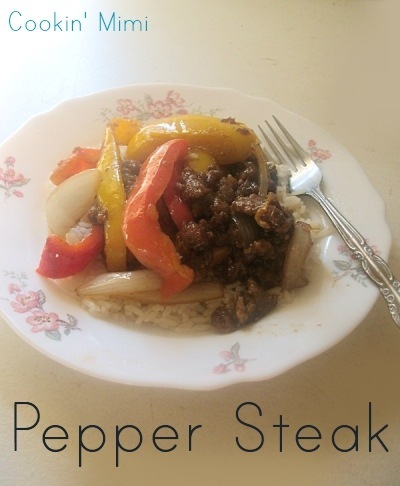 This easy and delicious pepper steak recipe can be on your dinner table in about half an hour. Pepper steak is a dish I’ve been eating since I was about eight years old. My recipe is a little different than my mother’s but retains enough of the same flavor that each time I make it it brings back good childhood memories. This was actually the first dish that I would eat the peppers in and started me on my love of bell peppers. Before Mama cooked this I would only eat the stuffing from stuffed bell peppers. Heat one tablespoon oil in a large skillet. Cook the onions and peppers until desired tenderness. Remove and set aside. Coat the steak with the cornstarch. Heat the remaining Tablespoon of oil in skillet. Cook beef in batches until well browned. Mix together the soy sauce, garlic, ginger, and sriracha. Add the peppers and onions back to the beef. Pour sauce over the beef and vegetables. Cook for 3-5 minutes or until the sauce has thickened. Looking for more quick and easy recipes? Give one of these a try. That looks delicious. I cannot wait to make this for my family. Thank you for sharing it.